The dichotomy between people and technology poses a threat to Human Resources, but to me the combination is as exciting as it is inevitable. HR centers around people. As every blog on the subject will remind you, the term is, after all, human resources. And yet, the extensive research from both Deloitte Press and Converge presents the immense benefits of integrating artificial intelligence (AI) and the Internet of Things (IoT) devices (such as electronic wearables and “smart badges”) as a part of the HR paradigm for self-service applications and chatbots, as well as traditional data collection. 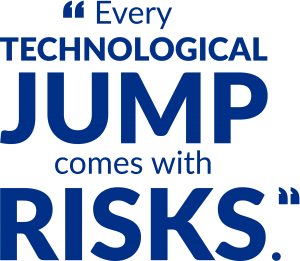 Every technological jump comes with risks. Success lies within the managers who can discern and sort out the diamond in the rough, while staying on task and meeting company expectations and requirements. Each company and every management team has their style and opinion on what is needed currently and in the future to be a successful resource to employees. Whether it is IoT, gamification, or biometrics—each company has individual needs. Here are some thoughts on the benefits and the drawbacks of AI in HR. From streamlined data entry procedures to tracking employees’ moods and well-being to configuring the most productive day for each individual, the benefits of AI and IoT integration appear unparalleled to the technological upgrades of the past. Deloitte reported on a company who saw an 80% increase in productivity after installing IoT devices and analytical models that predicted downtime among employees. The “quantified employee” will streamline daily tasks while offering extensive data on the state of your employees’ wellbeing and habits. If fully integrated and implemented, this technology could drastically affect how we view workdays and workspaces, to name a couple of elements on which AI and the IoT will have an effect. Incorporating AI technology into recruitment modernizes and enhances the search for an ideal candidate. The Headstart App, for example, is recruitment reimagined; the company found that traditional recruitment and hiring practices cost too much money, whereas the Headstart app reduces time spent on recruitment by 70%. Headstart combines psychometric testing with algorithmic analysis to match a job candidate to the company culture. No longer do you need to rely on filters, keywords and phrases but through new systems you can now culturally match with the best applicants. Another study estimated that a manager spends up to 23 hours sifting through resumes for a single hire. AI will help deliver more specific candidates by checking resumes beforehand to filter, separate, and eliminate applicants whose initial credentials don’t fit the position. It can also work on the other side of the process by tagging resumes whose language and/or credentials match the needs and desires of the hiring manager. There are already applications in use that craft an avatar of a company’s “perfect” candidate and then match resumes to that profile. I believe that AI and IoT won’t replace HR professionals, but instead will free up time and space for quality control. As mentioned above, with reduced time and effort spent on processes such as recruitment, data entry, and weekly reports comes more time to dive deep into the inner workings of your department. The best HR teams have a finger on the pulse of every part of the company they serve. The reality is that the less time spent on responsibilities that could be automated, the more time can be spent on truly capitalizing the human responsibilities of your HR team. The main concern that plagues skeptics now is the loss of the “human element.” If there is a threat inherent in quantifying both your applicants and your current employees, it lies in what falls between the cracks. A machine can’t sense animosity between two employees, nor can it overhear a worrisome conversation in the break room. While AI will free up time for HR professionals to re-invest in providing one-on-one service to their current employees, it’s imperative that the use of AI or IoT in quantifying employees or candidates does not result in simplifying HR to data on a spreadsheet. If these machines learn and mirror past patterns to develop their “thinking” systems, where is unique strategy in recruitment that differentiates the edgy start-up? All this technology promises to do is streamline the system and/or decision-making strategies that companies already utilize. AI should not make all hiring decisions. Utilizing technology to make initial verdicts could negatively impact the spontaneity in hiring. AI will always take the anticipated, well-trodden path rather than taking a chance on a unique resume or candidate. It is an exciting time in HR. AI and IoT technology will find a place in your enterprise bringing numerous options, solutions and new problems to the table. Keeping abreast of emerging HR technology will give your organization a head start for when your team is ready for change and prepared to implement AI and IoT solutions. Keeping your eyes and ears open to all the new emerging capabilities will give you better positioning when you decide. What do you find to be the most interesting technology in AI or IoT for HR? Share your comments with me on social media. Canada Is Legalizing Marijuana – What Does That Mean for Me?